What an unusual year! Hot and dry – rains in summer; it’s no wonder plants are blooming at unexpected times. Among the species that keep on flowering are the fall-blooming sunflowers. For example, the Big gumplant (Grindelia camporum) in Mother Nature’s Garden of Health has bloomed off and on from June to now. 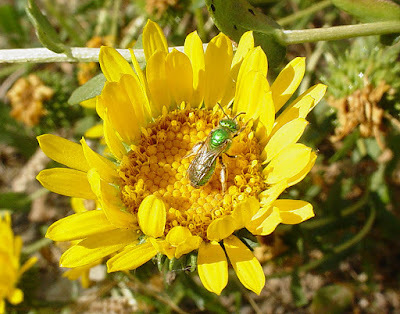 Big (Bracted) gumplant has many common names, among them California gum plant, Giant gum plant, Field gumweed, Bracted gumweed, Grindelia, Hardy grindelia, Rosin weed and Scaly grindelia. To add to the confusion, the local variant (formerly known as var. 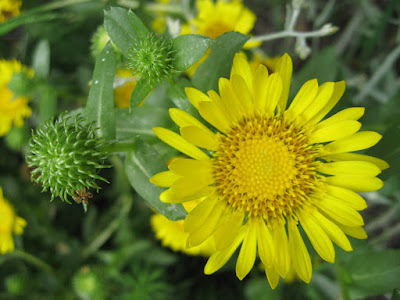 bracteosa) is also known by several previous scientific names: Grindelia robusta var. bracteosa and Grindelia robusta var. robusta. At any rate, we’ll leave it at ‘Big gumplant’, since that name describes it so well. 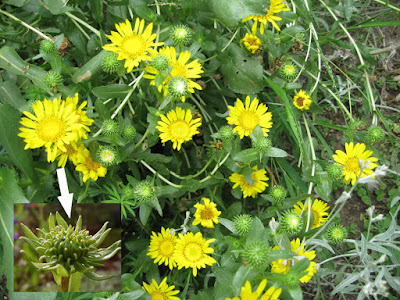 There is even debate about whether Grindelia camporum deserves its own taxon. Some advocate lumping it with several other California gumplants into the broader Grindelia hirsutula Hook. & Arn. The Integrated Taxonomic Information System (ITIS) lumps; the USDA Plants Database, Jepson Manual and Calflora still accord it species status. For this posting, we’ll side with the splitters. 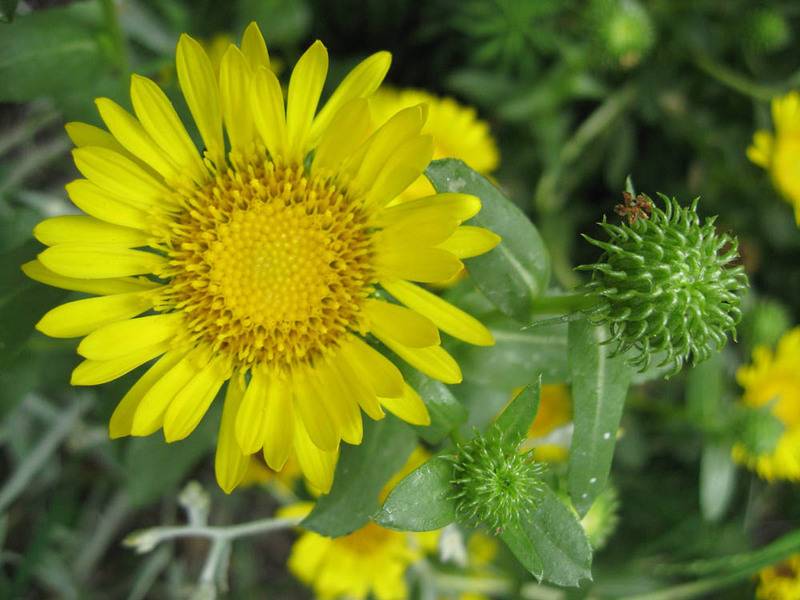 We’ve grown both Grindelia camporum and G. hirsutula in the garden. And while they have their similarities, the two (at least those available in the local horticultural trade) look and behave somewhat differently in the garden. Big gum plant is native to North, Central and Southern California as well as Baja California, Mexico. In Southern California it grows along the coast, in the Coastal and Transverse Ranges, and in the Peninsular Ranges of California and Baja California. 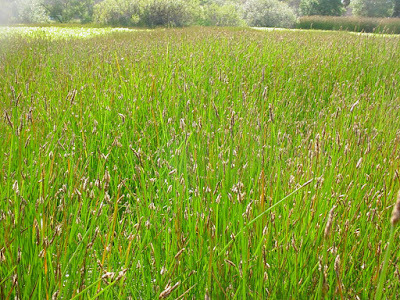 Locally, it grows in the Santa Monica Mountains and once did in the seasonal wetlands near Long Beach, the Dominguez Hills and the Palos Verdes Peninsula (including the San Pedro/Los Angeles Harbor area). Big gum plant grows most often in seasonally moist areas: along roadsides, in arroyos and washes, along seasonal streams/wetlands and other places that get a little extra winter water. 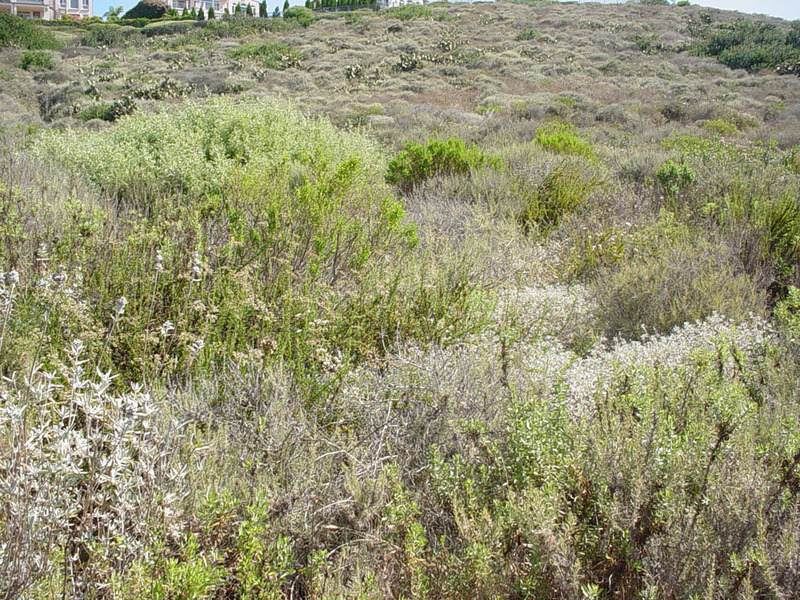 It’s a member of several lower elevation plant communities, including the chaparral and coastal sage scrub, occurring at elevations from near sea level to about 4000 feet (1200 m.). The local soils are primarily alluvial – either sandy or clay – and may be saline and alkaline along the coast. 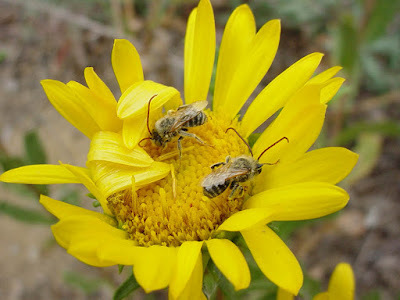 Grindelia camporum is a drought-deciduous, herbaceous perennial or part-woody sub-shrub. 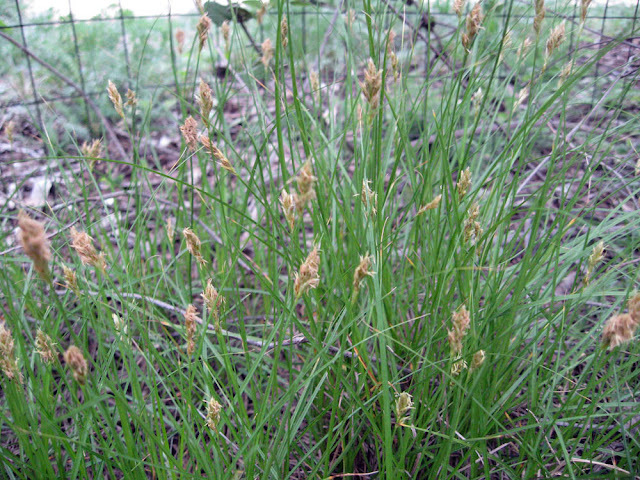 It quickly grows to 2-4 feet (about 1 m.) tall and about as wide. It spreads via both rhizomes and seed, and will fill in bare patches in the garden. It has stout, erect stems that become woody at the base with age. 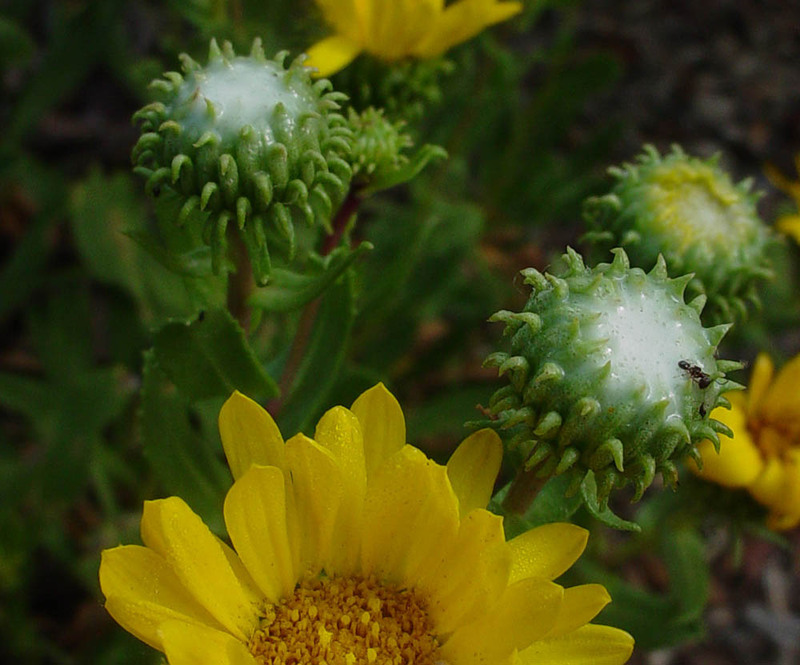 The entire plant has a robust appearance; if you need a more delicate appearing gumplant, try Grindelia hirsutula. Young stems are quite erect, but they tend to lean as the season progresses. The stems are thick – almost succulent – and are smooth and somewhat sticky with resinous secretions. The leaves are medium green, alternate and clasp the stem. They are thick, leathery and quite sticky. Foliage and flowers all have a strong, distinctive, resin-like aroma. You’ll get to know this fragrance well as you handle the plants. We like the scent, but some probably don’t; smell the plant before purchasing it. 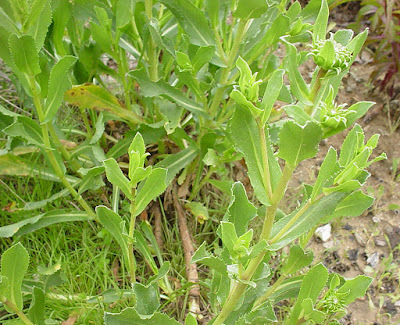 The basal leaves are largest (to 6 or 7 inches), oblong and usually sharply toothed. 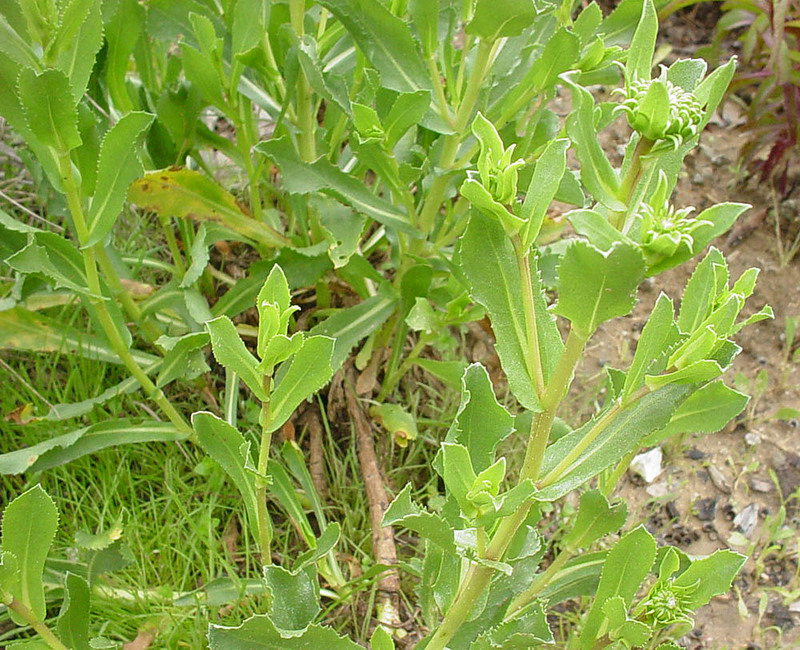 Leaves become smaller – and more elongated – further up the stem. Many gardeners love Big gumplant because of the flowers. A member of the Sunflower family, Grindelia camporum produces flowers in typical ‘sunflower heads’. The flower heads are of medium size (one to 1 ½ inches across), with about 25 bright yellow ray flowers (the ‘petals’) and numerous yellow disk flowers in the center. The flowers are decorative as only sunflowers can be. Several floral characteristics differentiate the Grindelias from other sunflowers. First, they produce a gummy white substance that likely protects immature flowers from disease/predation. You can see the gum in the picture above; it disappears as the flowers mature. This ‘gum’ was reportedly chewed by children as a gum substitute in previous eras. We’ve tried it and concluded it was probably chewed for pleasure only by pretty desperate kids! It was chewed as a medicinal gum (more on that below). The second unusual feature of Gumplant flowers are the green bracts surrounding the flower head – the phyllaries. These are particularly showy in the Gumplants, and can sometimes be used to distinguish between gumplant species. The phyllaries of Big gumplant are flattened at the base, but cylindrical and hooked at the tip (see photo above). The phyllaries bend out in this species, forming a distinctive ‘cup’ below the flower head. Big gumplant (Grindelia camporum) spreads via rhizomes. Big gumplant begins blooming in late spring (May) and can continue well into the fall (October or even November this year). In drier local gardens – and in the wild – this species often loses its leaves and even dies back entirely in summer. If rains occur in summer or early fall, the plants may green up and bloom again in fall. That’s what they did in our garden this year. The gumplants, like sunflowers in general, are insect pollinated. They attract a wide range of pollinating insects including native bees, European honeybees, pollinator flies/wasps and butterflies. In general, gumplants are good all-round insect plants; many gardeners use them for just that reason. The seeds are small and distributed by wind – if not eaten by hungry birds. The plants may move around the garden via new seedlings planted by Mother Nature. In our gardens, Big gumplant looks good for 4-5 years, then either dies out or is ready to be replaced. Fortunately, it is easy to propagate from seed. Collect fresh, dry seed in summer; plant in recycled nursery containers in late fall, and you’ll have replacement plants by next spring. Remember to just barely cover the seeds with potting soil – they need light to germinate. You can also easily propagate from stem cuttings in summer. Just stick 12 inch, semi-woody cuttings into one-gallon pots (we stick up to 6 per pot; insert about 6 inches deep). Keep the soil moist, then wait for the cuttings to leaf out and produce roots. Not all will take, but at least several should do well. Grindelia camporum is a facultative wetland plant in California; it usually grows at wetland margins or other seasonally moist areas. So, this plant needs good winter/spring rains to establish and succeed. If Mother Nature doesn’t provide, you’ll have to do the honors. Once established, Big gumplant plant is quite drought tolerant. If you don’t mind the summer die-back, water only occasionally (or not at all). You can get by with watering it once or twice a month in very well-drained soils. 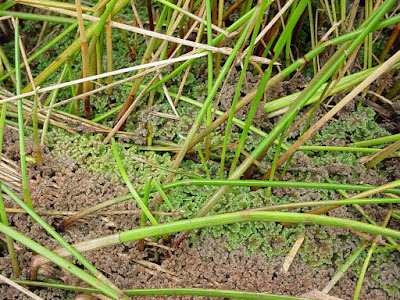 In clays, summer water appears to decrease the plant’s life-span. Big gumplant tolerates a wide range of soil textures. We’ve grown it at both extremes; the only difference is the need to limit summer water in the clays. 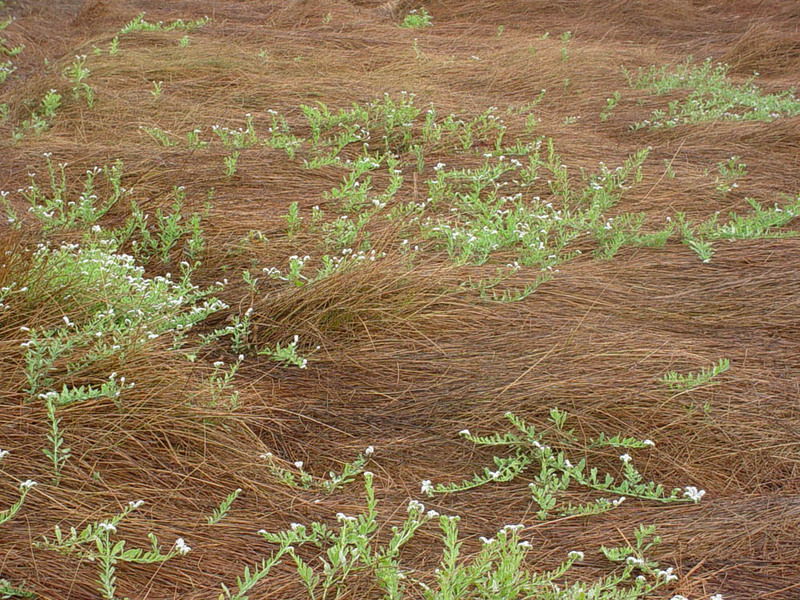 Plants even tolerate the salty, alkali soils sometimes found right along the coast. They like full sun and will become leggy otherwise. And they look better if cut back to about 12-15 inches when they go dormant. Some cut them back in summer (they do look a little ratty); others wait to prune in fall. Those in moister, colder climates (where gumplants are winter-dormant) may want to cut back in early spring. That’s really all the management these plants need. 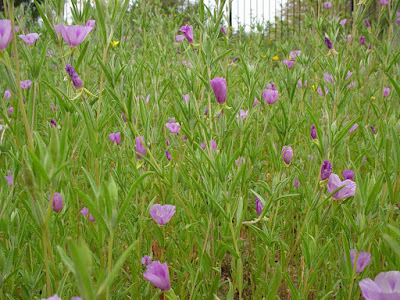 Big gumplant is routinely planted in habitat gardens in western Los Angeles County. It provides nectar/pollen for insects and seeds for the birds. 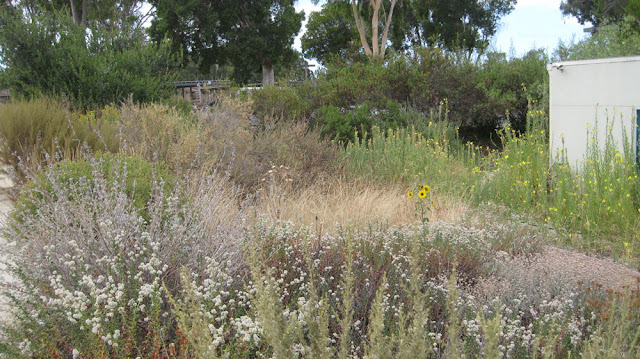 It looks great with other local water-wise natives including the bunch grasses, sub-shrubs (particularly the native Buckwheats and Salvias) and larger chaparral shrubs. Just remember, this is a large, robust-appearing plant - place accordingly. The cheerful yellow flowers and fresh scent make it a nice addition to many gardens. The flowers contrast beautifully with the spring penstemons and fall asters. Some gardeners even grow Big gumplant in their herb or medicinal garden. The Grindelias, and Grindelia camporum in particular, have a long history of use as medicinal plants. In fact the genus name honors David Hieronymous Grindel (1776-1836), a German pharmacologist, physician and professor of botany at Riga, Estonia. Native Californians traditionally used Big gumplant both externally (as a poultice or infusion) and internally (as an infusion - or gum chewed as a remedy for sore throat). A poultice made from fresh flowers and/or foliage or an infusion of the dried plant is applied to skin rashes, minor burns, eczema, dermatitis and other superficial skin conditions. This external use – along with appropriate antibiotic creams if needed – may provide relief by numbing the nerve ends. We’ll discuss how to make and use poultices later this month. Big gumplant has also been used as an infusion (tea) and tincture to treat conditions associated with excess respiratory mucous: bronchitis, coughs and bronchial asthma. It was used as a homeopathic medicine in the U.S. and Europe until the 1960’s, when the U.S. FDA required such products be formally tested for safety and efficacy. While Grindelia tinctures can still be purchased on-line, the needed clinical trials have yet to be conducted. Several smaller studies suggest that this medicinal should be used with caution, and should not be used at all by patients who are pregnant or breast-feeding, or have kidney disease, hypertension or heart conditions. Those aged 55 and older need be particularly careful, since kidney function decreases with age, and many of the active chemicals are excreted in the urine. 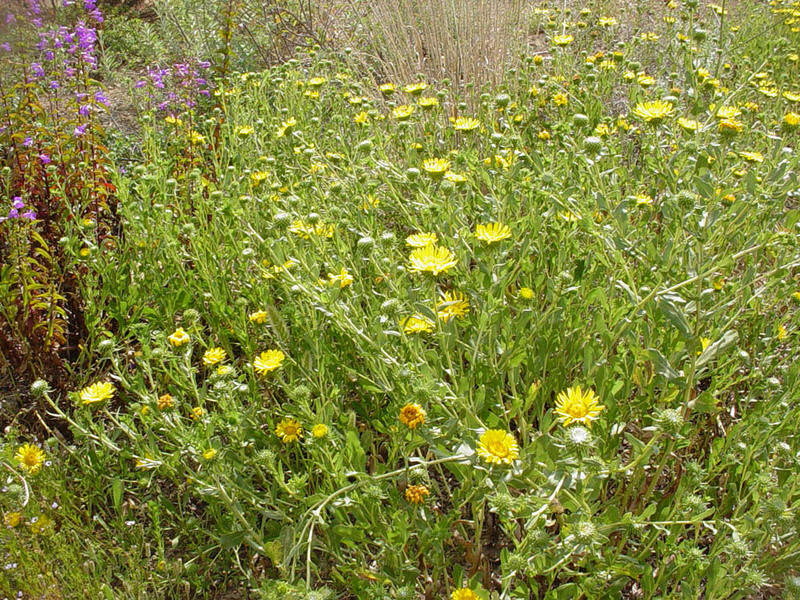 Grindelia camporum produces a wide range of plant chemicals including grindelane diterpenoids, balsamic resin, volatile oils, other terpenoids, saponins and many others. The exact modes of action for most of these chemicals are currently unknown. However, Grindelia camporum extracts appear to slow heart rate, decrease mucous production, and decrease inflammation both by blocking nerve endings and possibly acting as an antibiotic. In summary, Big gumplant is a robust perennial sunflower with excellent habitat value. It is easy to grow, requiring little care and not much water. The flowers are lovely and attract a parade of interesting insects. The blooms are particularly attractive when contrasted with the purple flowers of the Salvias. 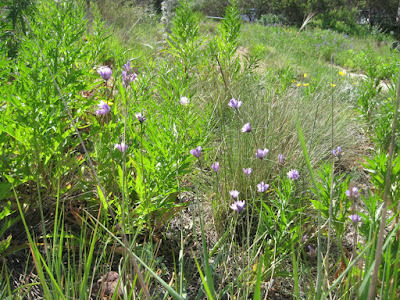 The plants have useful properties, including use as medicinals and dye plants. We hope you’ll consider Big gumplant when you need a local sub-shrub. The Fall, 2015 CSUDH Native Plant Sale will be held Friday, November 13th and Saturday, November 14th. The sale features locally native (and some other CA native) plants, including a large selection of plants for rain gardens, ponds and containers. 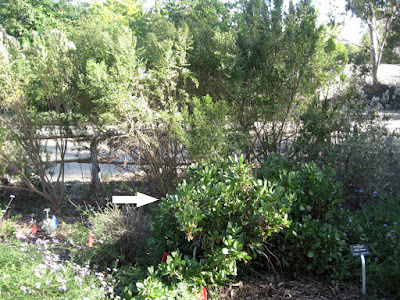 The plants are grown on campus, and donations support greenhouse and restoration activities in the South Bay. Reasonable prices - easy parking. Last month we discussed shade plants suitable for the next 50-75 years (http://mother-natures-backyard.blogspot.com/2015/09/sustainable-gardening-trees-for.html). Climate change is forcing us to seriously re-think our plant choices. The climate models suggest that long-lived garden plants in our area will need to tolerate more heat, more drought and years with greater than average precipitation (El Niño conditions). That’s asking a lot of a plant! We thought you might enjoy learning why some plants are more heat-, drought- and flood-resistant than others. We’ll try to keep the discussions straight-forward and relevant to home gardeners. But we will discuss aspects of plant anatomy, physiology and ecology that are relevant to the topics. If you don’t care about the details, skip to the end of the articles, where we summarize the bottom line for gardeners. After four years of serious drought and water restrictions, most California gardeners are concentrating on drought tolerant solutions. But what makes one plant drought tolerant and another water-loving? The answer is more complex than you might imagine. Drought tolerance is broadly defined as the ability of a plant to withstand periods with no or little water from precipitation or irrigation. While this definition is helpful, not all drought tolerant plants are equally drought tolerant. In fact, drought tolerance can range from modest to extreme (more on this later). 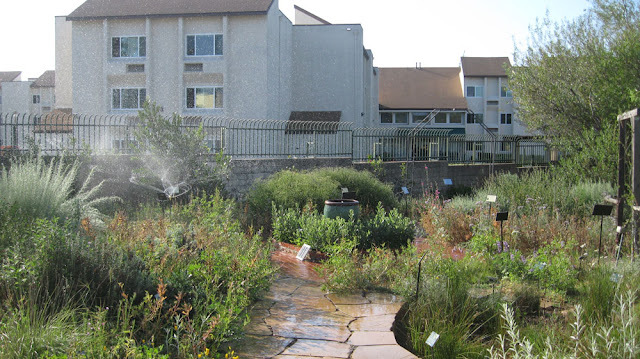 So you can’t assume that all drought tolerant plants need the same (small) amount of water. The timing of drought is equally important as the severity, particularly for California native plants. Some drought tolerant plants need a little water year-round, some need occasional summer water, while others require a period of absolute drought in summer and fall. 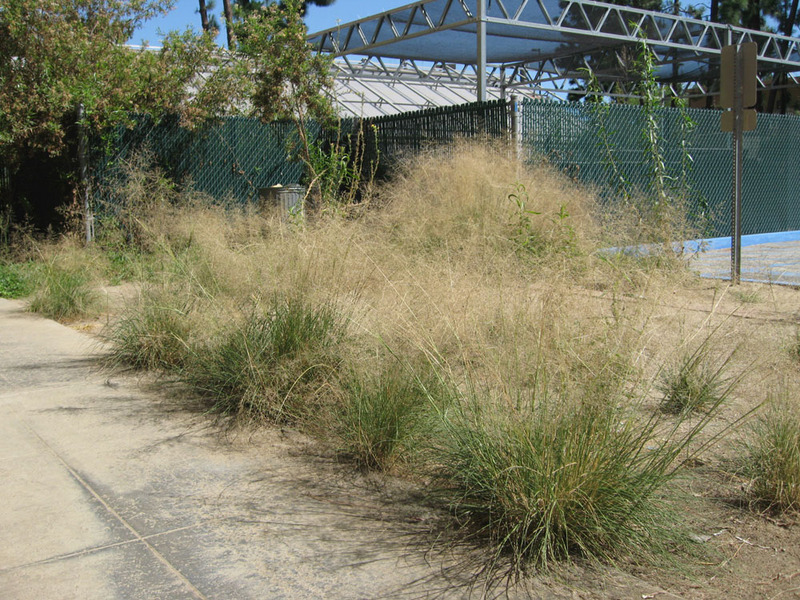 The details of a plant’s drought tolerance depend to a great extent on the type of drought conditions the plant normally experiences in the wild. The more our gardens mimic a plant’s native conditions, the better that plant will do. In Southern California, drought tolerant plants evolved under several types of conditions: 1) areas with very low yearly precipitation, occurring almost entirely in winter (Mojave desert and other places with less than 10 inches (25 cm.) of winter/spring precipitation a year); 2) areas with very low yearly precipitation, but with some summer precipitation from ‘summer monsoons’ (Sonoran desert; parts of Baja California; dry mountain foothills of San Diego county and, to a lesser extent, Orange & Los Angeles counties); 3) areas with adequate seasonal (winter/spring) rainfall, followed by a long (6 months or more) yearly dry spell (mediterranean climate areas like the Los Angeles Basin). So, why worry about the differences between these three types of drought regimens? Do they have any relevance for the California gardener? The answer is yes. The mechanisms plants use to survive very low precipitation vs. seasonal rainfall can be very different. These differences are key to plant survival, particularly in places with year-to-year rainfall variability. And these differences will likely become increasingly important if precipitation becomes more erratic. We’ll discuss this further at the end of the article. But first, how do drought tolerant plants differ from their thirsty cousins? Plants employ several basic strategies to increase their drought tolerance. These strategies are: 1) to avoid drought; 2) to postpone dehydration and; 3) to withstand severe dehydration (desiccation) and rehydration. Within each strategy, plants employ a range of mechanisms to make themselves more drought tolerant. 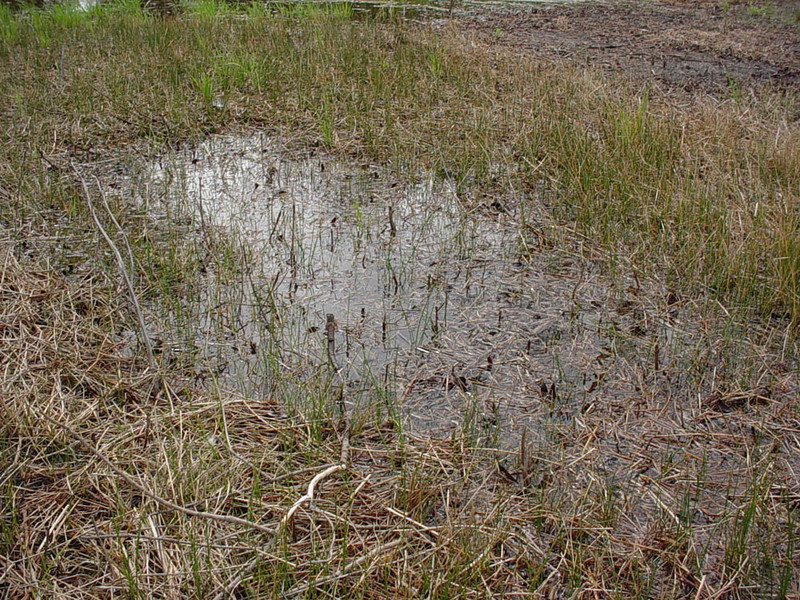 Some plants simply avoid drought by limiting their lifespan to periods when the soils are moist. Winter/spring annual grasses and wildflowers are good examples. Plants from both low- and seasonal-precipitation climates have adopted this avoidance strategy; that’s why annual wildflowers grow in both types of desert (in ‘good rain’ years) and in the western regions of Southern California. It also explains why desert and coastal wildflowers can each be grown in the other climate: all that’s required is enough moisture at the right time. Mature seeds are very dry, with a 90% to 95% loss of moisture in many cases (you’d be a mummy at this desiccation level). The seed embryo enters a state of suspended animation and remains so until moisture becomes available. Some embryos can remain viable for 100’s of years; others (often the smallest seeds) need to germinate quickly or they will die. But most seeds can survive at least a few years of drought – so this is a pretty good survival strategy in dry places with variable yearly precipitation. Other plants produce underground propagules (in this case, embryonic plants) inside bulblets (new bulbs) and cormels (new corms). 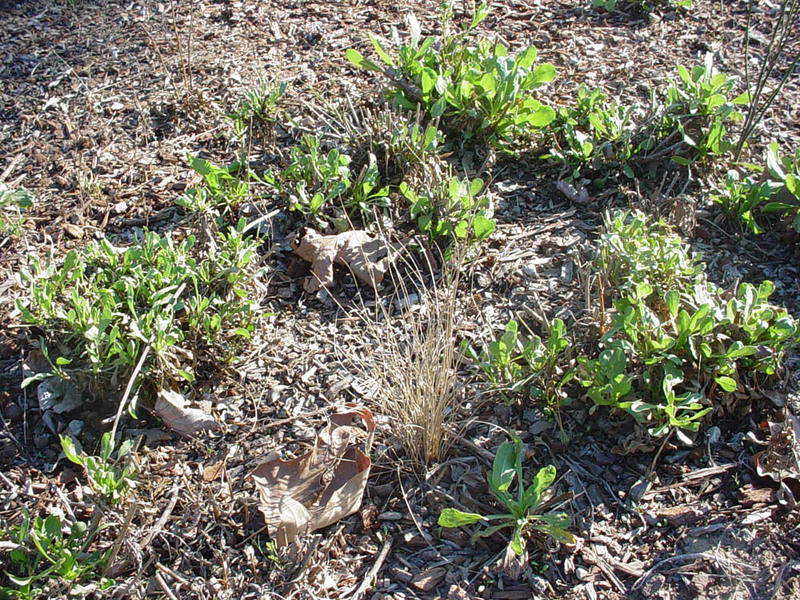 The parent plant may die during the dry season; but the small, more drought tolerant offspring are likely to survive. As veteran California gardeners know, bulbs, corms & tubers are a bit more vulnerable to prolonged drought than are seeds. Some tissue water is generally required to maintain viability, so a prolonged drought (like the present one) can kill some native bulbs and bulb-like perennials. This also explains why native bulbs are more common in wetter western S. California than in the deserts; desert soils are often too dry, for too long. A second class of strategies involve desiccation avoidance; mechanisms that keep key plant tissues hydrated for as long as possible. The most important tissues, of course, are those that produce new, post-drought growth (dormant buds); but roots and other important organs are also selectively spared. Most drought tolerant plants – and particularly those from Mediterranean climates - use this strategy. There are a large number of ways to postpone dehydration and Southern California plants often employ several. That’s one reason why local native plants may be better long-term choices than non-native plants. They simply avoid desiccation better than their non-native counterparts. In short, they are prepared for our erratic and often unpredictable climate. Some plants delay desiccation by storing extra water during the rainy season. Many local plants do this to some degree; but some can stockpile a good deal of water. A classic example is the cactus, which stores water in its fleshy stems, then uses it as the plant dries down in summer. Other plants have fleshy leaves (succulents) or roots modified to store water. Perennial plants that die back to the ground in summer are examples of this latter strategy. 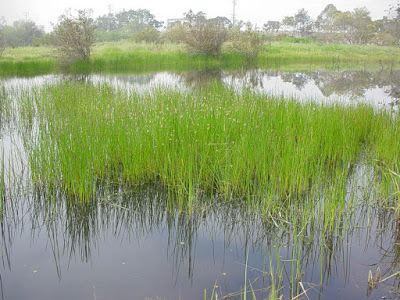 They remain alive – albeit at a low-functioning level – due to water stored in bulbs (example: native onions), tubers (example: the Manroot or Marah macrocarpus) or other fleshy roots and rhizomes (examples: Yerba mansa; Douglas iris). The underground storage structures can be impressive in size. Tubers of mature Manroot plants can be several feet long and weigh up to 500 lbs. (225 k.); they can sustain plants through years of drought. Other plants, particularly the herbaceous perennials of the S. California Coastal Dunes/Bluffs, Coastal Prairies and Coastal Sage Scrub, have smaller storage roots. But most store enough water to get a plant through the normal yearly dry season. 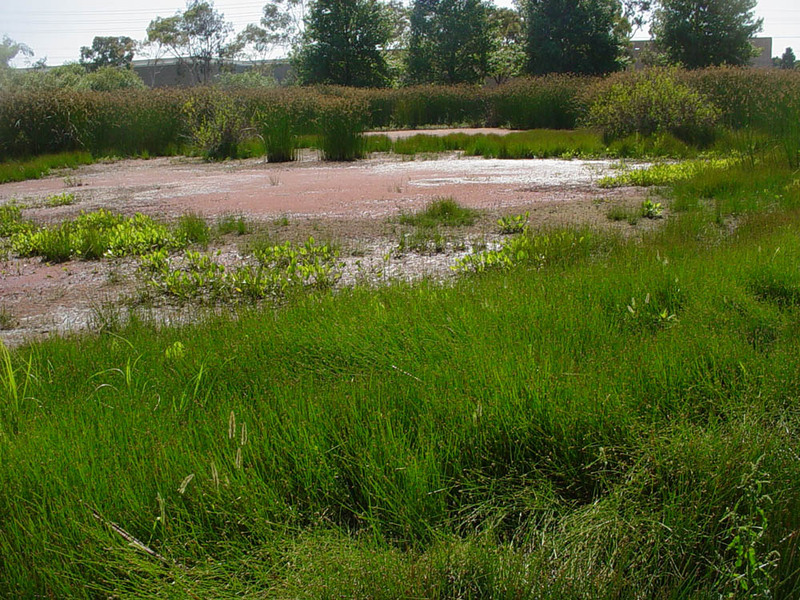 In gardens of the future, winter rains may not be sufficient. Supplemental winter/spring irrigation will likely be needed to allow these plants to store water during dry winters. Since plants lose water primarily through their leaves, many drought tolerant plants have modifications that decrease leaf water loss, either directly or by decreasing the temperature of leaves. Waxy surfaces, dense hairs, light coloration, thickened ‘skin’ (epidermal) cell walls and fewer stomata (the pores through which most water is lost) all help decrease both leaf temperature and water loss. Many local plants exhibit these modifications; they are part of what make our native plants so unique and attractive. 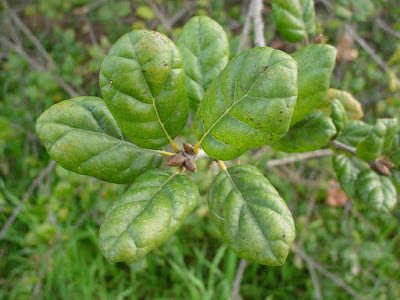 Many evergreen chaparral shrubs and the local live oaks have sclerophyllous leaves. These leaves are relative small, tough, thick and leathery – picture a liveoak leaf and you’ll get the picture. Such leaves are well adapted to mediterranean climates. Not only do they conserve water, they also discourage herbivory (being eaten), a distinct advantage in harsh climates, where growing new leaves comes at a price. 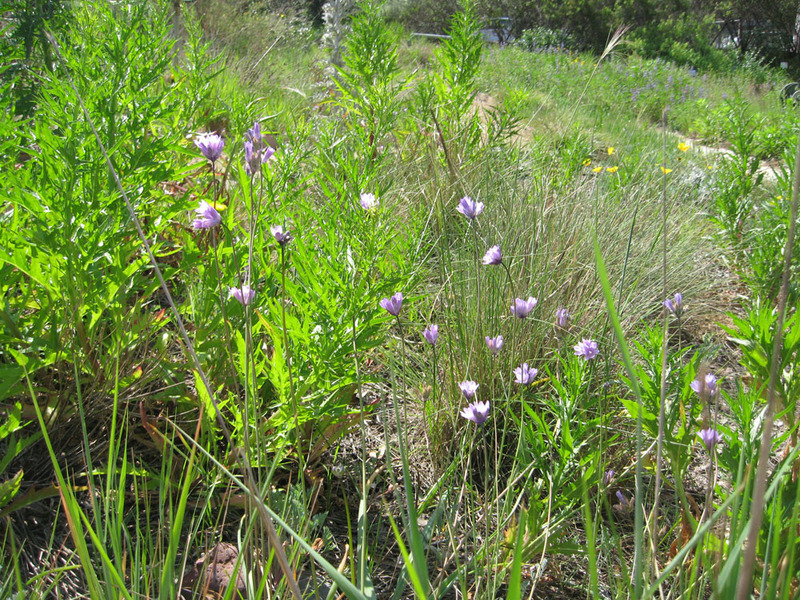 Other leaf modifications can also be seen in locally native plants. Some plants, like the Salvias (Sages), produce two sets of leaves: a set of larger, fleshy leaves for winter/spring growth and a set of smaller, drier leaves to get the plant through summer/fall. Other locally native shrubs simply lose their leaves in summer/fall. They decrease their life processes to very low levels by maintaining low – but survivable – hydration levels in the buds that will form new leaves. 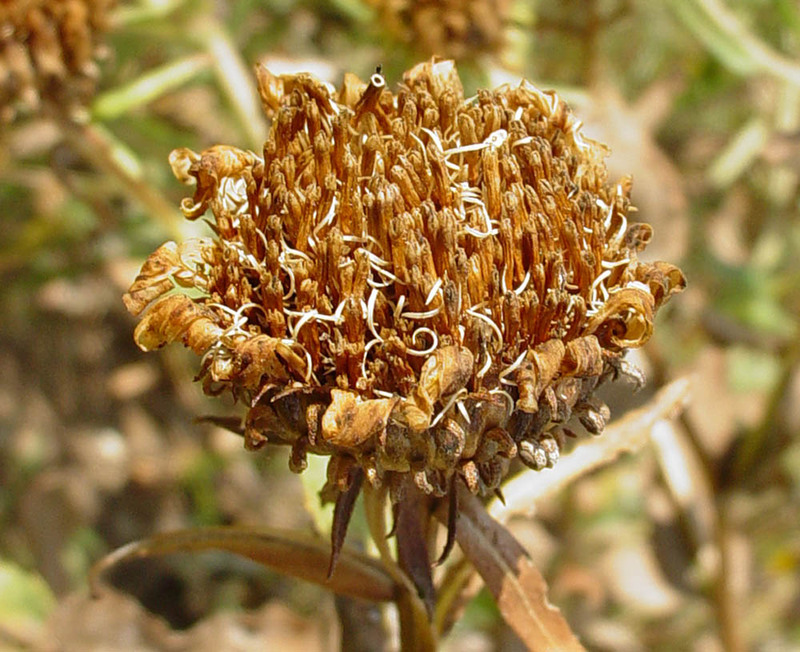 A well-known example is California encelia (Encelia californica), which normally loses all its leaves in summer (unless it gets a little summer water). But there are even more subtle ways of delaying desiccation. Carbon dioxide supplies the carbon needed for photosynthesis, a process that occurs, at least in part, during the day (sunlight provides a direct source of energy) [1, 2]. Since carbon dioxide gas enters the leaves through the stomata (leaf pores), most plants keep their stomata open during the day. But having carbon dioxide enter - and water vapor exit - through the same pores creates a problem in hot, dry climates. What’s a plant to do? Open the stomata (and lose water) or close the stomata (and decrease the photosynthesis need for growth and other plant functions)? Some plants decrease water loss by keeping their stomata closed during the hot part of the day – or even all day. How is this possible? Some plants only partially close their stomata during the driest times – a compromise that usually leads to decreased growth during hot, dry periods. Other plants, particularly the water-wise grasses, have a complex anatomy and physiology that allows them to keep their stomata partially closed, but still photosynthesize efficiently and grow normally. Not surprisingly, such plants are more common in hot climates. To learn more about these plants, known as ‘C4 plants’, we recommend references 2-4, at the end of this article. Another group of plants, known as the Crassulacean Acid Metabolism or CAM plants, store carbon at night and use it for photosynthesis during the day [6, 7]. This allows them to open their stomata at night and close them during the day. Not surprisingly, CAM plants evolved in dry climates, where closing stomata during the day gives them a distinct advantage in terms of water loss. CAM plants include cacti, succulents, bromeliads, some sedums & euphorbias, agaves & yuccas, aloes and other plants we think of as ‘desert plants’. Since CAM photosynthesis is less efficient, some CAM plants switch to CAM only when needed – in hot, dry weather. Plants that survive really arid conditions need a variety of ways to conserve water. 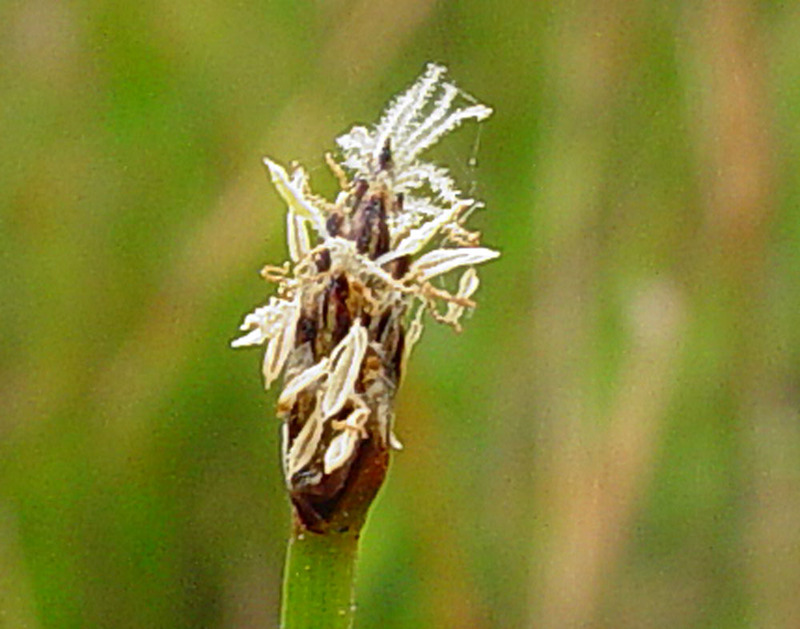 Most CAM plants exhibit other desiccation avoidance mechanisms such as fleshy water storage organs, rudimentary leaves, waxy cuticles, light color, etc. But what makes these plants very drought tolerant can also make them vulnerable to over-watering, particularly during the dry season. We’ll discuss this problem in more detail next month (November, 2015). A third way plants delay desiccation is to develop roots that make efficient use of available water. Nearly all California native plants take up water entirely through their roots. So it’s not surprising that S. California natives have several types of root adaptations, allowing them to make best use of our variable rainfall. Some plants have net-like roots in the top several feet of soil, allowing them to effectively use scant rainfall. 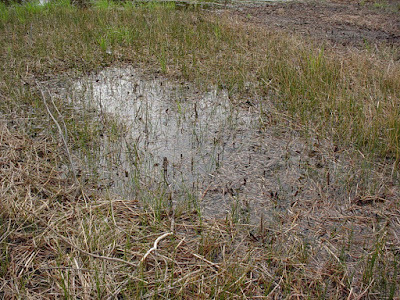 Even the limited amounts of water produced by fog drip can be taken up efficiently by these small, shallow roots. Most plants native to the L.A. Basin have at least some shallow roots. Other plants have long roots that can access water deep in the ground. Even drought tolerant perennials, like the California poppy (Eschscholzia californica), have a long tap root. 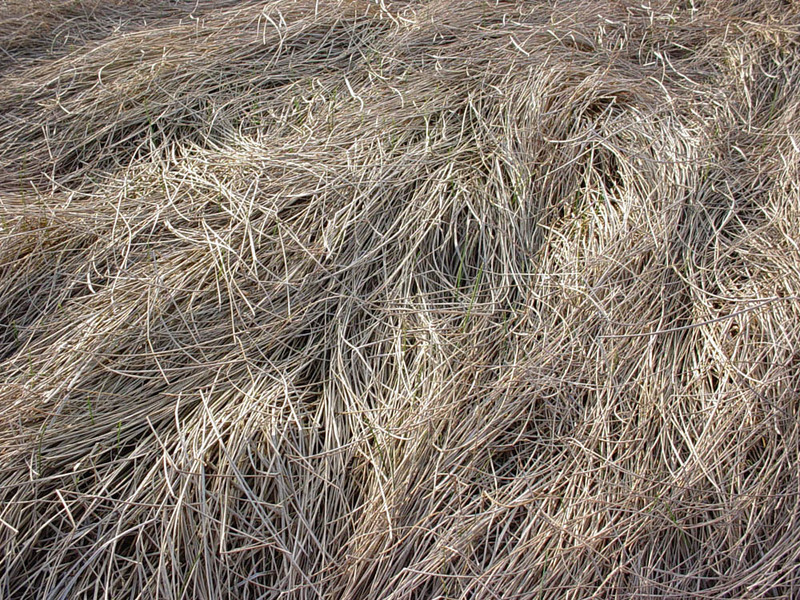 Many of our native perennial grasses have roots that are three to six ft. (1-2 meters) long, many times longer than the 6 inch roots of grasses from rainy climates. It’s no wonder our native grasses are more drought tolerant; they continue to access water deep in the ground, while non-native lawn grasses dry to a crisp. 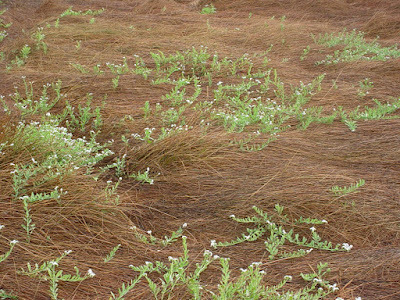 It also explains why we water native grasses differently than the non-native sod grasses. 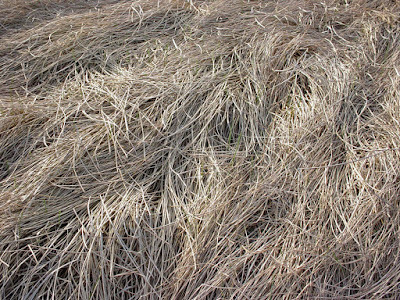 The short roots of most non-native lawn grasses require shallow, regular water; the natives survive on occasional, deep irrigation. The native shrubs and sub-shrubs (for which our region is famous) are even more impressive in terms of their root architecture. Most have a combination of net-like, shallow roots and deep roots, allowing them to take advantage of both shallow and deep water reserves. Typical Coastal Sage Scrub shrubs have roots that are three to six feet long. Chaparral shrubs, and the native trees, are even more impressive. Their roots can reach water at depths of 20 to 60 or more feet below the surface. Is it any wonder these plants remain green, even in summer? Why is water important for life? Nearly all S. California native plants survive drought by either avoiding or delaying dehydration. These are good strategies in our Mediterranean climate. They allow plants to function in dry times – albeit at very low levels – by remaining partially hydrated. Which brings us to the underlying question: why is water needed for survival? First, many of the chemical reactions of life require water (actually, it’s the chemicals dissolved in water; but the water is essential). Second, and equally important, water is critical for maintaining the architecture of tissues and cells. A wilted perennial clearly demonstrates this role at the whole plant level. But adequate hydration is even more important at the cellular level. It’s needed to keep a cell’s membranes intact. It also insures that cell components remain in their proper positions. Without water, fluids leak into places they shouldn’t be, cell components stick together, and chemical reactions don’t occur normally. In short, serious dehydration is usually incompatible with life on earth. Can plants survive being really dry? So how do some plants survive being really dry? 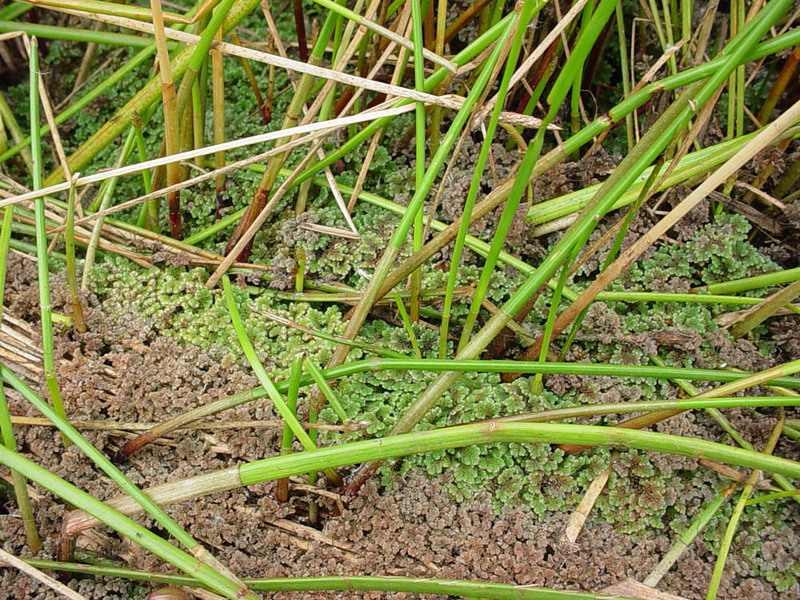 Some local native plants produce special chemicals that allow cells and tissues to retain their proper architecture and function relatively normally even when fairly dry. These chemicals take the place of water – up to a point. And there’s the rub. In fact, very few adult plants, worldwide, are able to withstand severe dehydration and rehydration. Which is curious, since all seed-producing plants possess this ability early in life (remember, seed embryos are essentially living ‘plant mummies’). Drying out to very dry levels, then quickly rehydrating when moisture is available, is extremely destructive for most adult plant cells. We’ve all seen the effects of severe dehydration on garden and house plants. There’s no way a dried out coleus is going to spring to life again, even if you water it! Trust me on that!! But a few plants have special mechanisms that allow them to do so, and many are called ‘resurrection plants’. They are mostly small and simple – the ferns and mosses figure prominently – but they truly can rehydrate and function after severe dehydration. The key to this miracle is the production of even more specialized chemicals. The molecules of these chemicals literally replace the water molecules, allowing the cells to retain their proper architecture while entering a state of suspended animation. Upon rehydration, the water replaces the ‘compatible solute’ molecules and the cell returns to relatively normal functioning. This is truly one of Mother Nature’s miracles! A similar process occurs when seeds dry out during seed development and rehydrate at germination. So the genes needed to produce the compatible solutes and other key chemicals are found in virtually all higher plants. Wouldn’t it be nice if ordinary plants could turn these genes on in times of drought? Rest assured that plant scientists are working on this and other ways to increase plant drought tolerance. But for now, our knowledge of drought tolerant plants can help us garden in ways that are both water-saving and life-friendly. In summary, S. California native plants survive dry conditions by either avoiding drought (annuals) or by preserving adequate moisture in their essential tissues. The most common desiccation avoidance mechanisms include: 1) storing water in specialized storage organs for later use; 2) decreasing leaf water loss though a variety of leaf modifications and; 3) accessing ground water with a combination of shallow and deep roots. Each drought-tolerant plant is well-adapted to survive its normal drought conditions, whether they include a bit of summer water or not. Understanding the mechanisms – and the drought regimen a plant normally experiences – can help us provide the best conditions for our drought tolerant plants. In addition, they can guide us in our planting and watering practices. Below are a few ideas. Not all drought tolerant plants are the same. There’s lots of evidence to support this – much of it relevant to California native and other mediterranean climate plants. A few basic principles are important when choosing, placing and maintaining drought tolerant plants. These principles - which come straight from Mother Nature, herself – are discussed below. 1. Some plants are more drought tolerant than others. For the most part, desert plants are more drought-tolerant than those from the Los Angeles Basin. But even locally native plants vary widely in their drought tolerance. This means that you should understand a plant’s water needs before you purchase and plant it. You also need to group plants according to their water needs. This is called Water Zone (Hydrozone) gardening. For more on this topic see: http://mother-natures-backyard.blogspot.com/2012/04/water-wise-gardening-tip-save-water.html. Native plant gardens and nurseries are good sources of information on plant water needs. 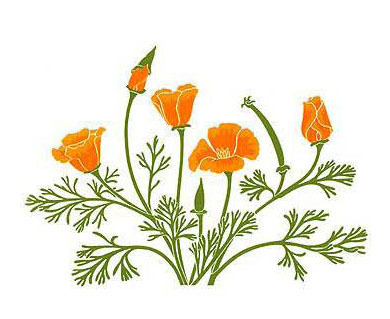 So are the many new books and internet resources on California native plants. We also provide water needs information for all the plants we feature: http://mother-natures-backyard.blogspot.com/p/learn-more-about-native-plants.html. If you don’t want to research the water needs for a number of plants, consider choosing plants that naturally grow together. These plants will have similar soil, water and other needs. You’ll only need to understand their common needs in order to water them correctly. 2. While desert plants are drought tolerant, they aren’t for every garden. Before you fill your garden with cacti and other desert species, consider the down-side of desert plants. Remember, desert plants are adapted to very low precipitation levels (often half the average rainfall for the L.A. Basin). An El Niño year in can produce four or more times the amount of rainfall usually falling in the local deserts. Some desert plants cannot survive this much water. In addition, desert soils are usually very well-drained – sandy or rocky. If you’ve done a soil percolation (perc) test (http://mother-natures-backyard.blogspot.com/2012/10/getting-to-know-your-gardens-soil.html) you know whether your soil drains quickly, slowly or somewhere in between. If your soil is sandy and well-drained, great. 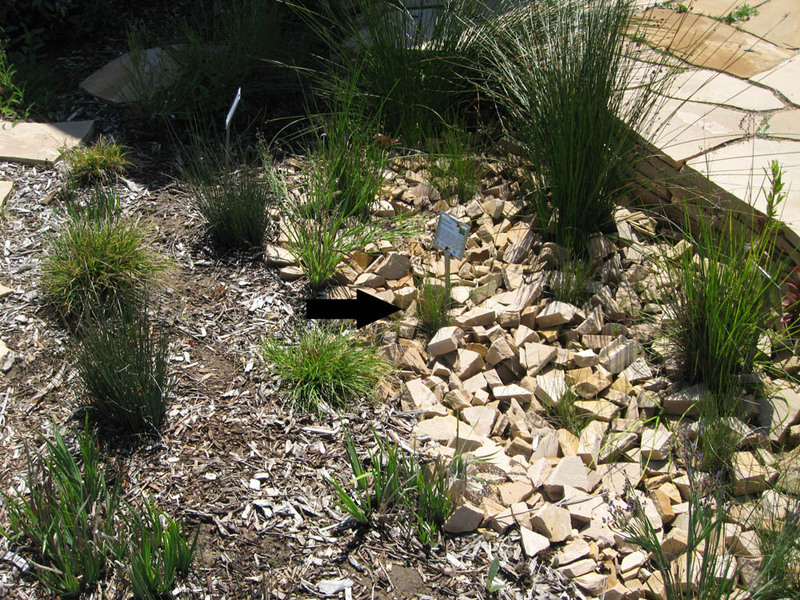 You can plant desert natives and water appropriately for the desert from which they originated (see #3). But how will desert plants stand up to El Niño years (or extra irrigation) in non-sandy soils? Only time and experience will tell. We’ll discuss flooding tolerance more next month; but we bet that some desert natives will not make it through an El Niño winter. This winter may provide an important test of water tolerance in desert plants grown in the L.A. Basin. 3. 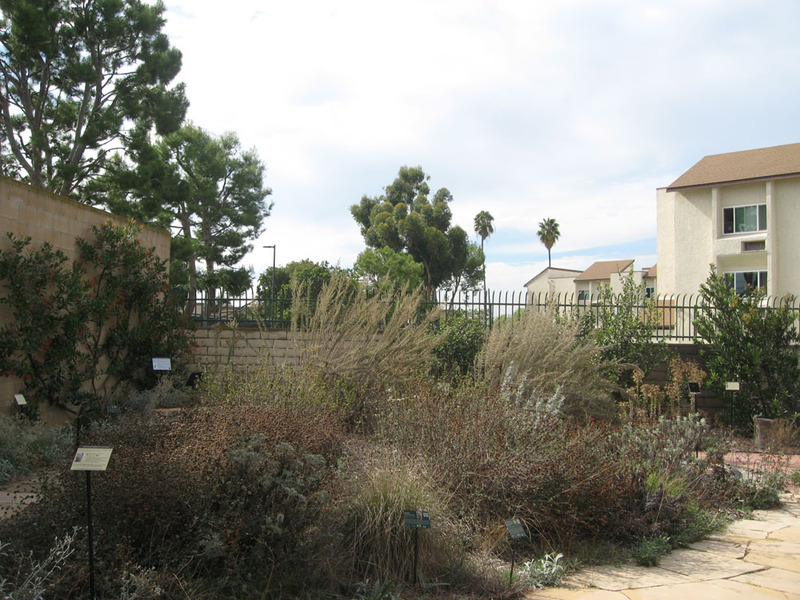 Local (L.A. Basin) native plants are adapted to a Mediterranean climate – wet winter/spring and dry summer/fall. 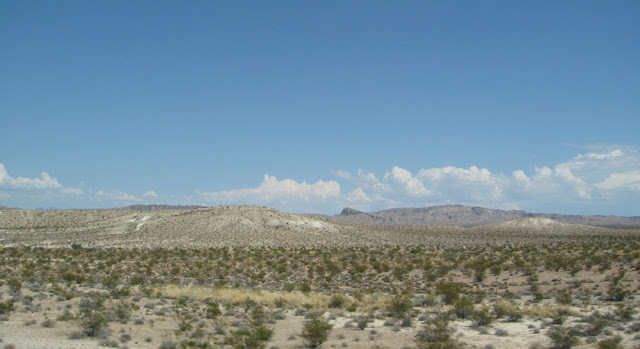 Plants from the Mojave Desert have a similar precipitation cycle. But plants from the Sonoran Desert, the deserts of Baja California and the dry foothills of San Diego County are adapted to both winter and summer (‘summer monsoon’) precipitation. They need some summer water; and in our area, you’ll need to supply it. The same is true of the ‘water-wise’ natives from Central and Northern California, which need even more water. Remember, a ‘drought-tolerant plant’ from Northern California is not the same as a drought-tolerant plant from Southern California. Get to know the natural precipitation patterns for the plants you grow. The more you mimic them in your garden, the happier a plant will be. It is possible to include plants from ‘summer dry’ and ‘summer monsoon’ regions in the same garden. But it requires thoughtful planning and grouping plants with similar needs together – then watering each Water Zone appropriately. For more on planning a garden based on Water Zones see: http://mother-natures-backyard.blogspot.com/2014/02/designing-your-new-california-garden-9.html. The most successful water-wise gardens are designed around the water needs of the plants they contain. They often include some plants that need regular water, as well as those that are water thrifty. And they do so while still being water-efficient overall. So, you can use plants that need regular water and those that are drought-tolerant in the same garden – but you need to plan and group plants. That’s the bottom line! 4. Not all ‘water-wise succulents’ have the same water needs. 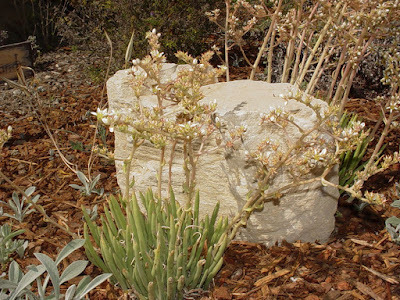 Many California gardeners are attracted to succulents; they are pretty and easy-care. But not all succulents have the same water needs. The ‘succulents’ native to the LA Basin and Santa Monica Mountains – the local Dudleya species – are adapted to our Mediterranean climate. They grow (and need adequate water) in winter/spring. And they must be dry in summer. To water them in summer is to doom them to an early death. This is a good example of why it’s important to know where a plant grows naturally – and what type of drought it needs. On the other hand, succulents from the higher mountain ranges of S. California (and from Northern California) need occasional summer water to get them through the dry season. Native Sedum species like Sedum laxum (Northern California), Sedum niveum (San Bernardino Mountains), Sedum spathulifolium (San Gabriel & San Bernardino Mountains; Northern/Central California mountains) and Sedum stenopetalum (Sierras; Northern California) are good examples. They require a different drought regimen, and shouldn’t be inter-planted with the Dudleyas. The majority of succulents available in local nurseries are not California natives at all. The ever-popular Echeverias, Crassulas, Aloes, Kalanchoes, Sempervivums and others are native to semi-dry regions that get summer rains. They are adapted to grow in the summer – the exact opposite pattern from our LA Basin natives. Contrary to popular myth, most non-native succulents really do need some summer water to keep them alive and attractive. And they will rot if they get too much winter water. Don’t plant them close to Dudleyas or other summer-dry plants unless you truly enjoy replacing plants! 5. Southern California native plants have unique roots that help them survive our variable climate. From roots that store water, to shallow roots that utilize small precipitation events, to roots that mine water resources deep in the ground - our local natives are uniquely suited to our climate. But as the climate changes, we need to remember that local natives need adequate winter/spring rain (10-15 inches per year) to survive the normal summer/fall dry season. The bottom line: water-wise natives must have adequate winter soil moisture so they can store up water for the dry season. If Mother Nature doesn’t supply, then we must provide - if we want our gardens to survive and thrive. And we must water correctly. Many California natives have deep roots requiring ‘deep irrigation’. This doesn’t mean 7 minute irrigation sessions, twice a week. It means occasional water, provided more slowly (so it doesn’t run off) and for longer times (hours rather than minutes). Can we save water by using such irrigation practices? Certainly!!! Many of us have done so for years. 6. It takes time for most plants to develop their drought-tolerance. Since root adaptations play a key role in drought tolerance, most S. California native plants must develop adequate root systems before they become truly drought tolerant. 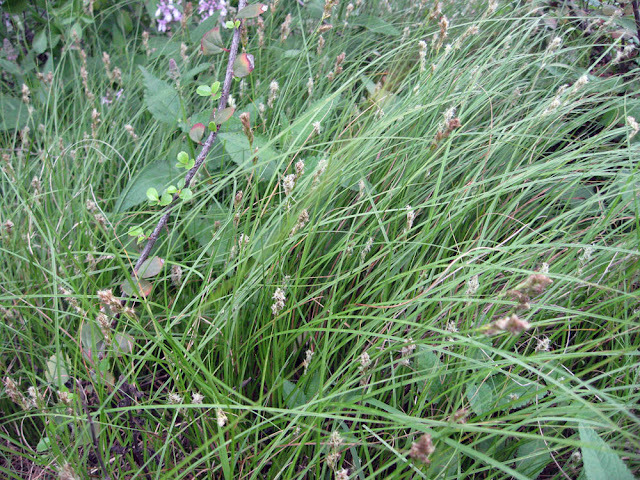 Native perennials and grasses require a full year or two. Smaller shrubs need 2-3 years and large shrubs/trees may take 4-5 years to become completely drought tolerant. Any drought tolerant plant needs time to develop roots and other desiccation avoidance mechanisms. Don’t presume that a drought tolerant plant needs no water from the minute it’s planted. Plants are like children – they need time to develop their full potential. We’ll talk more about planting and watering young plants in November and December (2015). 7. Plants with deep roots don’t like being moved. Many drought-tolerant California natives have very deep roots. Even the perennial grasses can have roots that are 4-6 feet long. Moving mature plants can damage long roots, leading to plant death. So, think carefully before selecting a place for deep rooted plants in your garden. They may be living there a long time! 8. Plant roots develop best when soils are uniformly moist. That’s just one reason why drought-tolerant plants are best planted during the rainy season. Cool temperatures and moist soils promote strong, healthy root systems. By the summer drought season, winter-planted plants are able to cope (with a little summer irrigation for the first summer or two). So plant with the rains if at all possible and your plants will get off to a good start. 10. 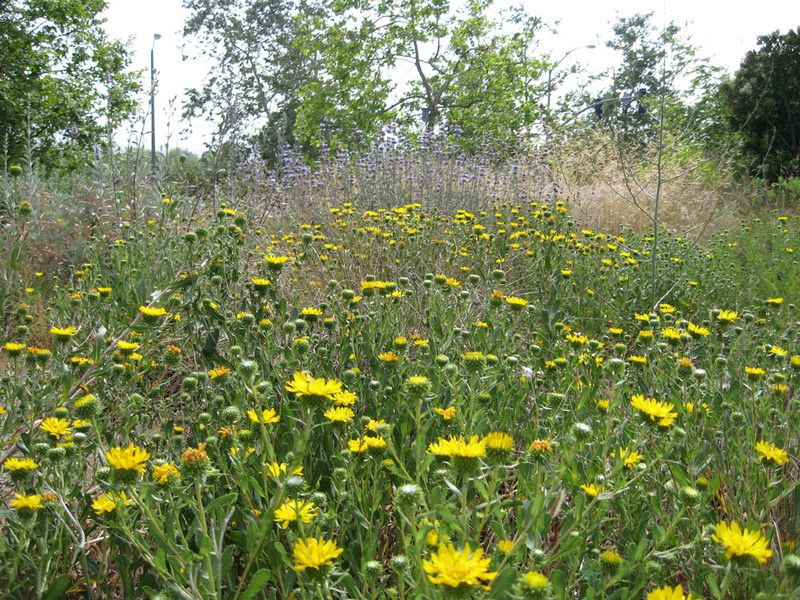 Local native plants have a variety of mechanisms to survive drought. That’s one reason why our local plants are so hardy – they are used to surviving our variable climate. When choosing water-wise plants, consider California native species in addition to those from Australia, South Africa, Chile and the Mediterranean region. You may have to search them out – native plant nurseries are not as abundant as conventional nurseries. But the search will pay off in the long run. Remember, these plants have had thousands of years to tailor themselves to our fickle climate. In addition to being drought tolerant, they provide food, shelter, scents and beauty to the home garden. They are our California legacy – something to cherish and enjoy throughout the year. California native plants ground us and give us a sense of place. They are what California living is all about!